By integrating healthy eating, environmental stewardship, and physical activity concepts into building and landscape components, the graphic communication system serves as a comprehensive teaching tool that brings the school campus alive by prompting students, teachers, and the community to make healthy decisions. Through its architecturally-integrated graphics, the campus celebrates learning, encourages connections to nature, and empowers students to become active compassionate stewards of their individual communities and identities. The transformation of the Buckingham County Primary + Elementary campus reveals a story of renewal and reclamation of both health and place. The interior and exterior educational graphics package for the schools is inspired by collaborative research study showing how architecture and design can influence actions by connecting students with an environment focused to inspire healthy decisions and a love of learning. 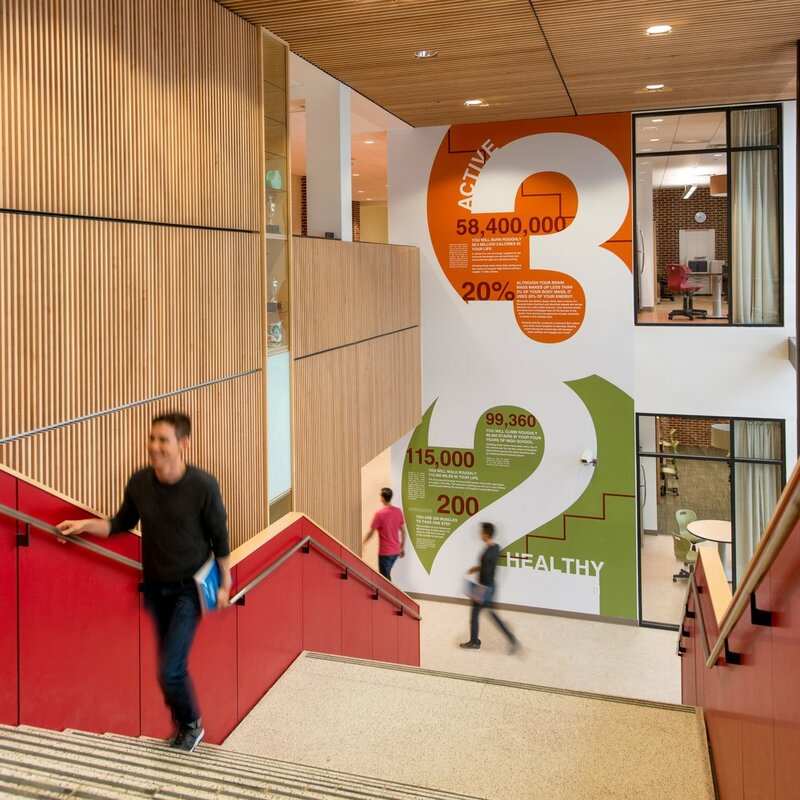 Educational signage renders the school’s healthy design features explicit and exciting. Stairways, water fountains, healthy food options, and sustainable building materials – co-located with illustrated, inquiry-based lessons – foster teachable moments about movement, hydration, healthy eating choices, and energy conservation. The wayfinding brings the natural environment to life for students. 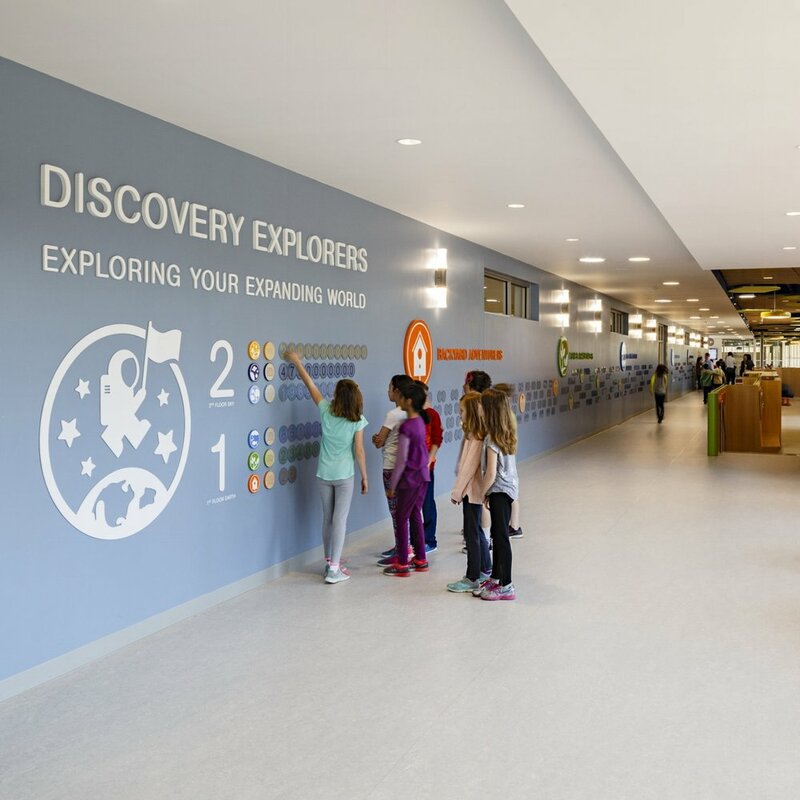 Moving from the Primary to the Elementary School, the campus’ wayfinding follows the progression of Virginia’s geography (mountains to ocean) and assigns a habitat to each grade. This branding encourages grade-level identity and introduces students to the natural world around them. Through its architecturally-integrated graphics, the campus celebrates learning, encourages connections to nature, and empowers students to become active compassionate stewards of their individual communities and identities.